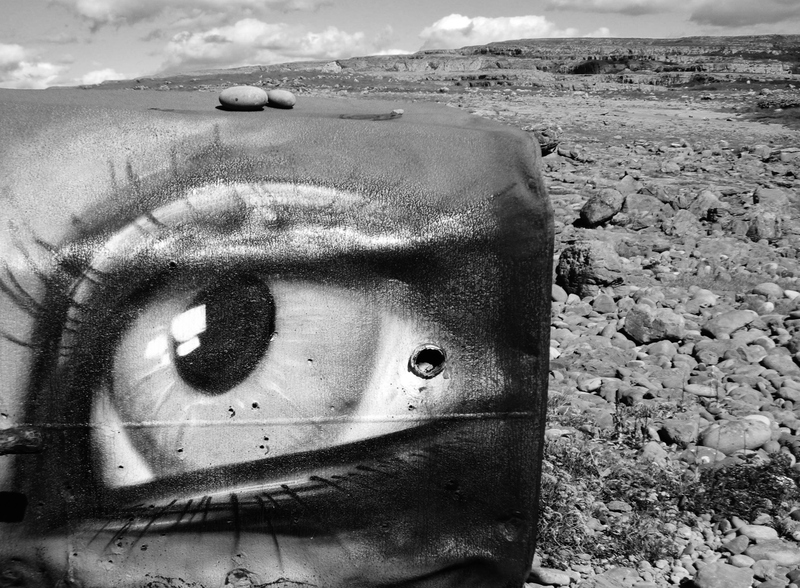 Beautiful and surprising Hanne, a stone eye. I was quite surprised bumping into this one on a walk along the coast in the wild west…. art and beauty is everywhere and somehow this one suited the beauty of the Burren and the sea. I kind of like it too lol Thank you, Steve! Hanne, it’s interesting that you and others have such a positive reaction to paint splashed on a stone on the Burren. Don’t get me wrong. It’s appealing in its own way and as usual your poem is apt and beautiful but what if the artist was not quite so proficient or the colors more garish? What if more artists started painting rocks, mountains and trees in the wilderness? Some of us go to the wilderness to get away from humans and human artifacts. It’s not a rock 🙂 It’s an old rusty container that certainly doesn’t suit the nature walk, however since it’s there, some brilliant artist decided to love it up instead with a, in my eyes, beautiful image… in a very surreal way, this somehow added to the walk and the experience. The surprise of it and the creative work of someone unknown. Malcolm, I do get your point, however I just had another thought while dish washing (dish washing is good for that 😉 To the extent I know artists, most have a deep innate sense and awareness of what is ‘sacred’, they have a sensitive eye and to them nature is already a masterpiece in itself, they know they cannot add to, only subtract from if they start painting on it. Hence why they bring their art of nature, if nature is what inspires them, to their atelier or photo-shop (of course there is the odd-ball, like the guy who decided to paint on Cliffs of Moher, quite a big task to take on lol! and it was indeed a disgrace to the majestic cliffs, caused a big uproar here, and was removed) I do see in most artists their main purpose in whatever art-form they express themselves in, are to find their own unique way, with a deep-rooted intention to add to the world, not subtracting from it. Another thought I had was, artists wish to have their work seen and known, few, if any, would want to hide it way out there in the wilderness where only the solitary hiker will see it… I think we would have seen much more ‘splashing’ in the wilderness already if your concern should be proven true. Malcolm, i agree to a degree, but it IS painted well, it covers up a rusty container! It surprises and amuses. If it was just a scrawl I would agree but someone has clearly taken the time direct the mind away from the discarded can. So all is well. Hanne, as usual, you blow me away!! Well done, ancient viking!! Beautifully said re the painting on the container! Wonderful poem, I do like its form. Thank you again and again Frédéric!